If you are interested in any of the following positions, contact Brian Everett at 952-466-6270 x201 or email. Sales Advisory Council. This newly created group is comprised of sales and business development leaders who will serve in an advisory capacity to help ensure TMSA provide meaningful, relevant educational and networking value to the Sales discipline in transportation and logistics. Time commitment for this group is minimum, with only conference calls, online discussion groups or email requests "on demand" when the Board of Directors or a committee needs input, advice or reaction to an issue or opportunity. Time commitment: Maximum 1-2 hours monthly. Education Committee Member At Large: Seeking individuals who would like to contribute to the efforts of developing relevant content for various initiatives, including the 2019 TMSA Logistics Marketing & Sales Conference. Skills include project management, a strong working knowledge of relevant issues in marketing and sales, and the desire to be part of a team that is responsible for delivering relevant content to the industry. Time commitment: 3-5 hours monthly, based upon interest, role and responsibilities. TMSA Sales & Marketing Metrics Task Force: Seeking seasoned professionals in sales and marketing who are interested in contributing to the strategy and approach of executing this year's annual metrics study. Time commitment: 2-3 hours monthly. Certification Director: Looking for a strategic thinker who has experience in a continuing education program, and is an active TMSA member and contributor. Time commitment 4-5 hours monthly. Volunteer Recognition Director: Needing a solid communicator to interview active volunteers and write profiles that highlight who they are and what they do in the industry - and for TMSA. 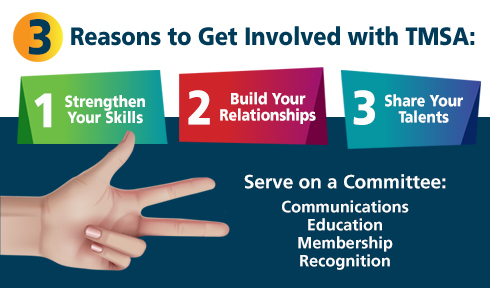 It's a great way to get to know some of your fellow members! Time commitment: ongoing/project-based, participate as you have time. Part of the Education Committee. Approximately 5-7 hours per article. Executive Awards Director: TMSA recognizes top leader through the annual Marketing and Sales Executives of the Year Program. This individual will be responsible for working with TMSA Headquarters to deploy the Call for Nominations and ultimately for overseeing the selection process. Part of the Recognition Committee. Approximately 2-3 hours monthly (August - June). Compass Event Director: As part of the Recognition Committee, this individual is responsible for overseeing the organization of the Compass Awards Banquet at the annual conference. Event planning and management skills idea. Approximately 2-3 hours March - June. Communications Committee Member At Large: Seeking individuals with solid writing/content development and project management skills, and who are willing to contribute to committee initiatives as needed. Time commitment: 2-3 hours monthly. Content Director (Communications Committee): Seeking an individual to give guidance to content strategy that ensure continuous, relevant content to members. Ideal skills include writing, content marketing, project management. Time commitment: 3-4 hours monthly. Social Media Director (Communications Committee): Searching for an professional who as an interest and passion in engaging members and prospects via social media channels. Develop campaigns that will support the mission of TMSA, particularly through LinkedIn and Facebook. Time commitment: 3-4 hours monthly. Market Segment Champions (Membership Committee): Seeking those with a good network in their particular market segment and want to collaborate with the Membership Committee and TMSA Headquarters in identifying new TMSA members and developing targeted campaigns that drive new members. Market segments currently available are: Technology, 3PL, Air Freight Forwarding, Railroads, Ocean Carriers, Port Authorities. Time commitment: 2-3 hours monthly.